As is the case with many introduced invasive species, wild pigs were an accidental creation. Spanish missionaries brought domestic pigs to California in 1769 for consumption, but after being released for foraging and not recaptured, they escaped domestication and became feral (wild). These feral pigs later bred with Russian wild boars, which were also brought to the state for sport hunting in the 1920's. Wild pigs are destructive pests with wide and ravenous appetites for a variety of plants and other animals. They compete for food with both wildlife and farm animals and will kill and eat wildlife and small farm animals. When wild pigs root through the soil to find food, they disturb native vegetation and dig up land meant for livestock to graze. When they enter urban areas, they can cause extensive damage to home lawns and gardens. It is estimated that wild pigs cause $1.5 billion dollars in economic damage to agriculture and the environment every year in California. Not only are they destructive, wild pigs can spread disease. They are known to carry several important pathogens that can be infectious to humans such as E. coli and Salmonella. They carry potentially devastating diseases to domestic livestock and wildlife and are hosts to 35 parasites that can affect multiple animal species. The 2006 outbreak of E. coli in California spinach fields is thought to have originated in wild pigs, though this has not been verified. The California Department of Fish and Wildlife considers wild pigs game animals. They can be managed through exclusion, trapping and/or shooting. To learn more about wild pigs and their management, read the Pest Notes: Wild Pigs. 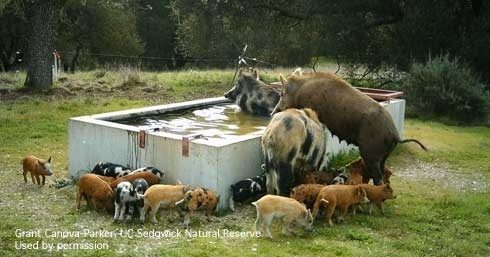 1- changes feral pig status/definition from game animal to exotic. 2- individual pig tags are replaced with a licence validation stamp $15 resident $50 non resident which is all that is needed to hunt wild pigs (plus a hunting license). 3- eliminates the requirement for a depredation permit. 4- prohibits a person from intentionally releasing any hog, boar, pig, or swine to live in a wild or feral state upon public or private land. 5- prohibits a person from engaging in, sponsoring, or assisting in the operation of a contained hunting preserve of wild pig, feral pig, European wild boar, or domestic swine within this state. 6- existing law requires that funds deposited in the Big Game Management Account be available for expenditure to, among other things, implement programs to benefit wild pigs. This bill instead requires that these funds be expended for the use of hunting to manage wild pigs.